Hunting Antelope, Elk & Mule Deer. Guides are available for all of the above. See contact information to Experience a Great Hunt! Only call lodge number during the months of October & November. For fastest service call Shari's cell number or email us. Enjoy a week or more of great hunting and great friendships in beautiful Colorado. You will be served great meals three times a day such as fall off the bone BBQ Ribs, Cornish Game Hens and thick Delmonico Steaks. Located in the center of the elk migratory path, Maybell, Colorado is just 40 minutes from Craig, Colorado - THE ELK CAPITAL OF THE WORLD. We have many repeat hunters and families that come to our lodge year after year. R & R Ranch of Colorado, Inc. is owned by husband-and-wife team Jeff and Shari Kempton, Shari Kempton is also the chairperson for the Rocky Mountain Elk Foundation - Gainesville, Florida Chapter. Jeff has been guiding this ranch for the past 25 years and knows the land as well as the animal movements throughout the private 27,000 - acre ranch. New alfalfa fields have been planted and water is supplied year round to ensure healthy and more resident animals. If you'd prefer to fish for beautiful Rainbow Trout, the ranch is just 30 minutes away from the historic Yampa River. 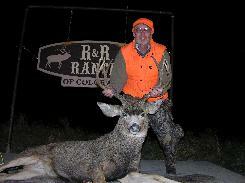 Or you can hunt game such as Antelope, Mule Deer and Elk . Your hunts can be guided or semi-guided. All the hunter has to do is harvest the animal; our guides will take care of animal retrieval and can either cape and/or quarter your animal for you or if you'd prefer to have your animal processed they can deliver it to Brother's Custom Processing, Inc. in Craig so that you can either ship it home or pick it up before your drive home. If you choose to have your trophy mounted our guides will deliver your hide and horns to Big Cat Taxidermy, in Craig. We have a new state-of-the-art animal processing building which includes: electric winches, hot & cold running water, wash down systems and a large 15 X 15 walk-in cooler to store your meat in at no extra charge. Breakfast, lunch and Dinner are served in the main lodge. After dinner you can either retire to the bunk house for a well earned restful nights sleep on brand new mattresses in the softest of soft Cabela's 3-D Camouflage flannel sheets, or you can hang out in the lodge for dessert. While waiting for dessert to be prepared you can watch the big screen TV, play cards or just enjoy the ambiance of the lodge.
" All or part of this operation is conducted on Public Lands under special permit from the U.S. Bureau of Land Management".